The Dental Divas of Whitemud Dental Centre are one of the leading cosmetic and restorative dental practices in Edmonton Alberta. 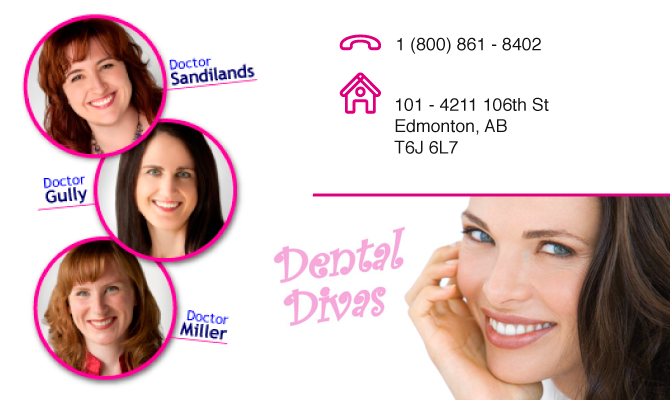 The Dental Divas are also known as the Whitemud Dental Centre and the dentists are located in South Central Edmonton Alberta, CA. Here, artistry meets science to provide a unique blend of caring, comfort and advanced dental procedures. The doctors, Dr. Kathryn Sandilands, Dr. Leah Gully and Dr. Clair Miller are focused on you and your dental health, and we’re here for you whether your dental needs are as simple as a cleaning or as intricate as dental implants. Please read about our special practice in the pages here, and then give us a call! We’ll be happy to see you and look forward to getting to know you!